CENTRAL — They were celebrating at the Ty and Wanda Hall home in Northwoods subdivision Tuesday night, as the news sunk in that their son, Cody Hall, was drafted in the 19th round of the Major League Baseball Draft. And it wasn’t just any major league team that wants their son but the 2010 World Champion San Francisco Giants! It was a remarkable turnaround for Cody who didn’t play baseball either his junior or senior year at Central High School and walked on at Baton Rouge Community College. In fact, until he tried out for BRCC, he had never pitched a game. But he certainly is a pitcher now — a pitcher with a blazing 90+ mph fast ball, a curve ball, a change up, and a slider. The fact that he’s a powerful 6-5 and 220 pounds doesn’t hurt either. The Giants are interested in Hall for his ability as a closer, but the truth is Hall is also strong as a starter. Cody Hall just completed his college career at Southern University, where he was named to the All-SWAC team, along with fellow Baton Rougean and Southern teammate Frazier Hall who was SWAC Player of the Year. Cody Hall said his experience at Southern was outstanding. “People at Southern really treated me well. It was a wonderful experience!” he said. Hall heaped praise on his coaches at Southern, especially head coach Roger Cador and assistant coach Fernando Puebla. “Coach Cador is a tremendous man with a great deal of wisdom. Every day, he taught us life lessons, using stories. He has had an enormous influence on my life,” Hall said. Assistant Coach Fernando Puebla, originally from Venezuela, knows baseball well and had a lot to do with his chance to play in the major leagues, Hall said. 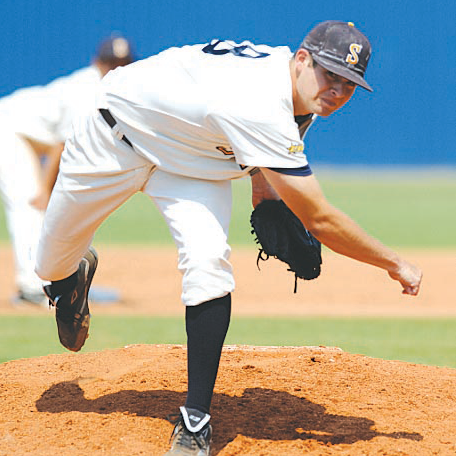 As a senior at Southern, Hall had a 4-1 record as a relief pitcher with 60 innings pitched, 64 strikeouts and 58 hits. His ERA was 3.71. He had two saves. Cody Hall’s father Ty is a crew leader at Georgia Pacific. His mother, Wanda, teaches at Riveroaks Elementary. She formerly taught at Central Middle. Cody’s brother, Corey Hall is 21. He played baseball for Central High but had an auto accident that slowed his baseball career. Cody said Corey hopes to play college ball. Cody said it usually takes five or six years for a pitcher to work his way to the major leagues but he hopes to do it in two to three. “I feel I could really benefit from the coaching I will receive. I’ve had great coaches but not a pitching coach at that level. I feel I have the raw ability and can become a lot better pitcher with the right coach,” he said. Cody Hall said he thinks he may be sent to play in Oregon this summer.